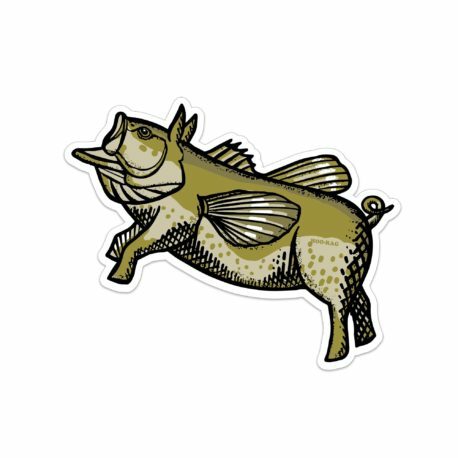 Oh, that happy feeling you get when you actually see pigs fly and smash that topwater plug. Or maybe they’re just trying to spit your worm. Either way, it’s pure awesomeness – just like this sticker. Oink oink. How does this get better? Send us cool pics to social@hoorag.com with the Hoo-rag UV sticker in weird or awesome places and we may reward you with something fun! Please put ‘Sticker Picker’ in the subject line. Great unique sticker got it on the back glass of my van! Returns may be sent back to Hoo-rag within 30 days. To receive a refund, please include a note detailing your name, your address, your phone number, the e-mail address you used to place the order and the reason for the return. Exchanges must not be opened. To exchange the product, please include a note detailing your name, your address, your phone number, the e-mail address you used to place the order and the product you want to change out. The product must be an equivalent exchange – we will not swap out a $17.95 product for $15.95 or vice versa.